A further four Silver Brumby titles in one beautiful edition. Following on from the success of the Silver Brumby Centenary Edition, this bind-up contains the next four titles in the Silver Brumby series – Moon Filly, Silver Brumby Whirlwind, Son of the Whirlwind and Silver Brumby, Silver Dingo and continues the story of thowra, the magnificent silver stallion, king of the brumbies. 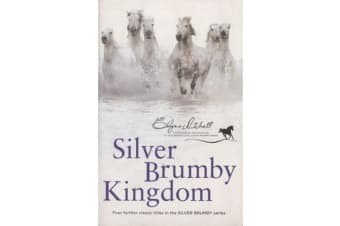 this beautiful edition will be treasured by the many fans of the Silver Brumby series, who will delight in these four titles being published together.